On Tuesday morning, so.360.cn replaced Google as the default search engine on Qihoo 360's portal Hao.360.com, which will radically alter the existing structure of Chinese online search engine industry. Qihoo's new search engine went live on August 16, and has in just five days overtaken Google and Sohu.com's Sogou to become China's second-largest traffic source. Baidu remains the market leader with almost 80 percent of China's domestic search traffic. After Google exited the Chinese search market in 2010, Baidu, Google's Hong Kong operation, and Sogou shared the country's search industry spoils. However, Qihoo's emergence is likely to shake up China's search engine market. 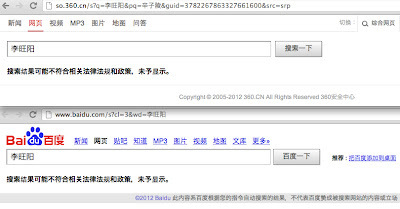 These screenshots, taken on August 21, show that a search for "Hu Jintao" (胡锦涛) on Qihoo and Baidu return very similar results. Both display an identically worded notice that "In accordance with relevant laws, regulations, and policies, some search results could not be displayed." (根据相关法律法规和政策，部分搜索结果未予显示。). In both cases, search results are restricted to the same strict white list of a dozen-or-so websites controlled by the central government and Communist Party. 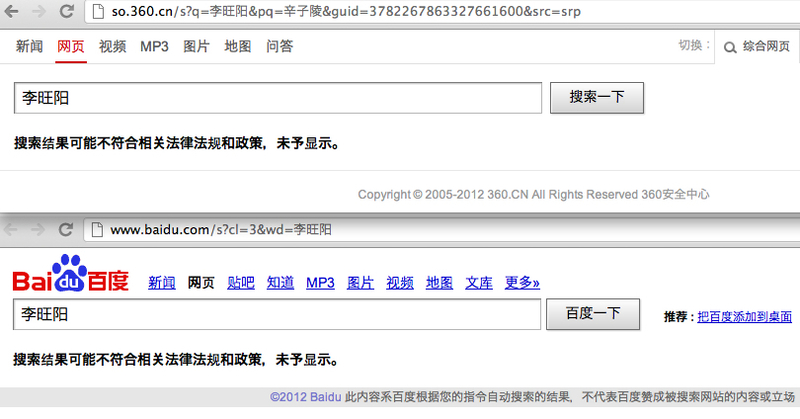 The only exception is that Baidu's top result is from its own "Baike," and Qihoo's top result is from "Hudong." 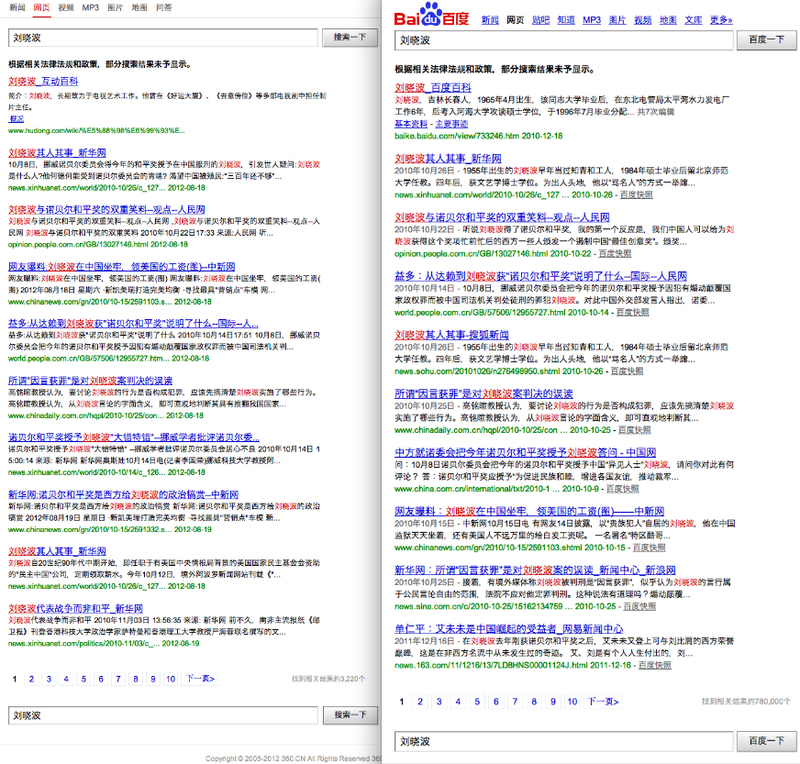 Hudong and Baike are wikipedia clones, and in February 2011, the state-sponsored Global Times reported that Hudong was appealing to authorities to conduct an anti-monopoly investigation on Baidu, alleging it manipulated searches and eliminated Hudong entries from its top search results. These next screenshots show search results for "Liu Xiaobo," (刘哓波) the winner of the 2010 Nobel Peace Prize who is currently imprisoned by Chinese authorities for inciting subversion. Once again, the top results for Qihoo and Baidu are Hudong and Baike, respectively. 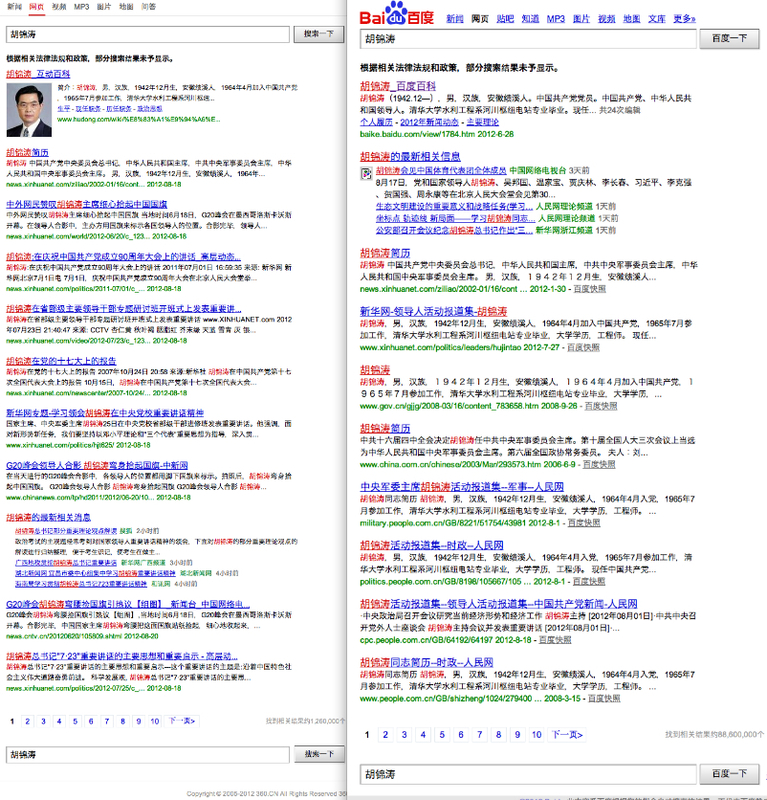 As was the case with "Hu Jintao," Qihoo once again restricts search results to the strict white list. 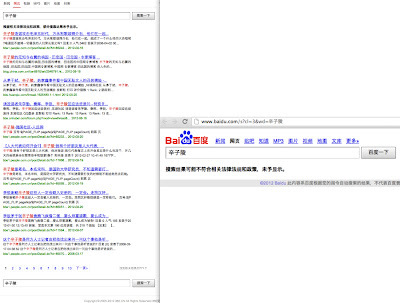 Baidu, however, restricts results to its broad white list, which includes large portal sites like Sohu, Sina.com.cn, and 163.com. 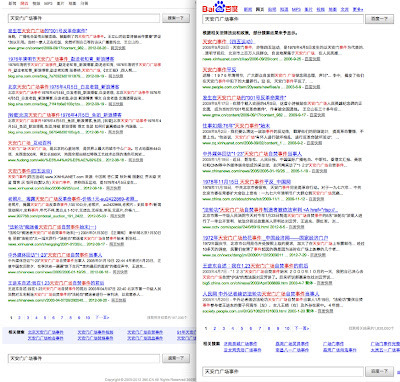 These screenshots show search results for "Tiananmen Square Incident." (天安门广场事件) In this case, Qihoo does not display any censorship notice, and appears to provide uncensored results. 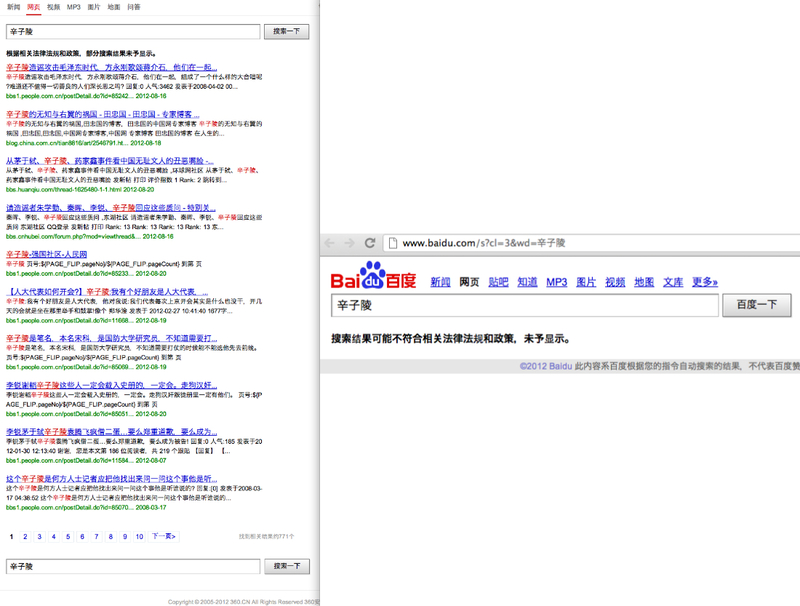 Baidu, however, once again displays the censorship notice, and restricts results to its strict white list. 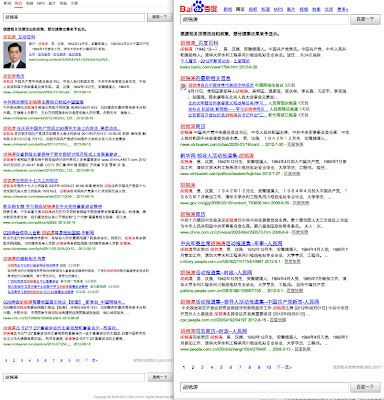 These screenshots show search results for Xin Ziling (辛子陵), a former official at the China National Defense University. 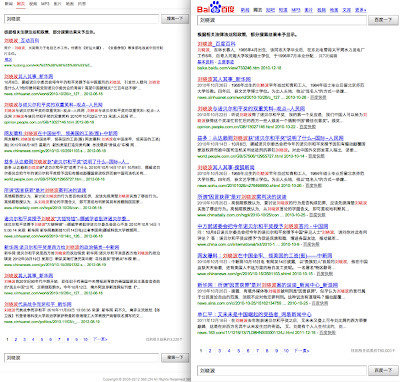 Qihoo appears to be restricting search results to its own broad white list, while Baidu returns no results, just a notice saying "Search results may not comply with relevant laws, regulations, and policies, and have not been displayed." (搜索结果可能不符合相关法律法规和政策，未予显示。). 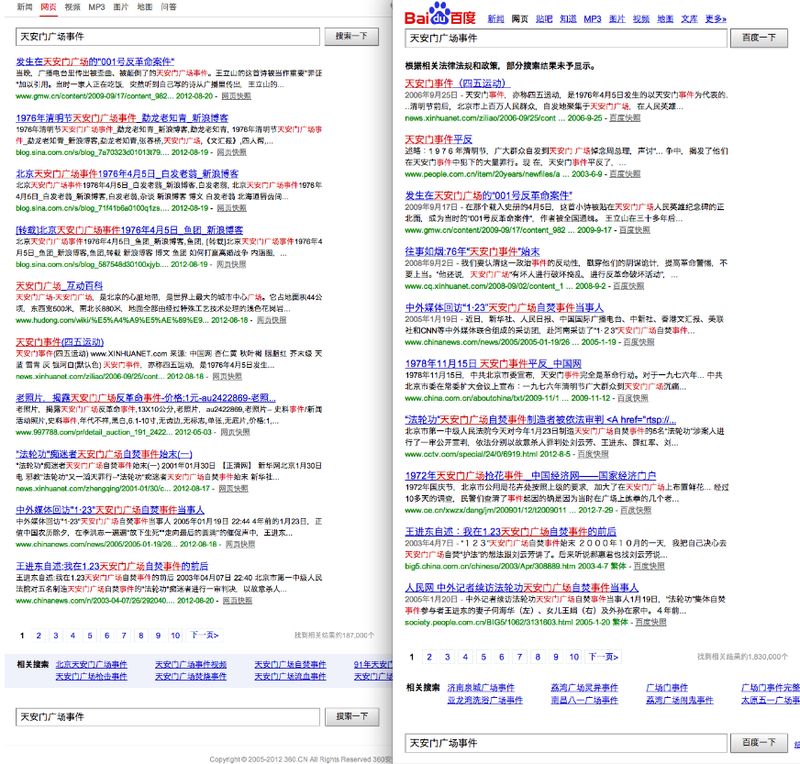 These last screenshots show search results for "Li Wangyang" (李旺阳), a labour rights activist who was found hanged to death earlier this year. In this case, neither Qihoo nor Baidu return any results, just an identically worded notice saying "Search results may not comply with relevant laws, regulations, and policies, and have not been displayed." (搜索结果可能不符合相关法律法规和政策，未予显示。).